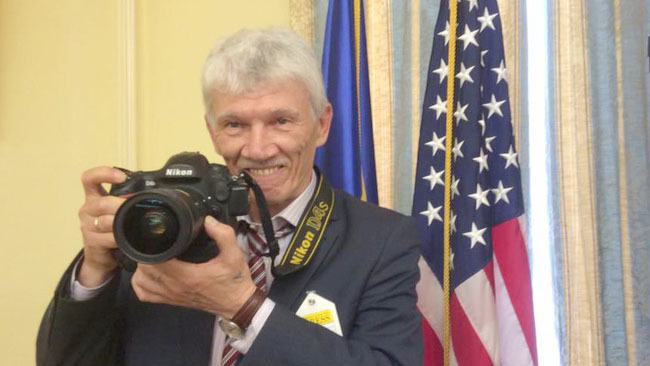 Mylola Lazarenko, the personal photographer of President Petro Poroshenko and, formerly, that of Viktor Yushchenko, calls himself alumnus of the Den photography school because he was our newspaper’s longtime photo correspondent, often took part in and won the Den Photo Competition and confessed more than once that, while working for our newspaper, he learned to see original details in the seemingly traditional “parquet photography.” Den gave him in fact a chance to make a name for himself. And the talented photographer amply revealed himself as a professional in our newspaper. Before Den, he worked for Kyivska Pravda. He once dared to take part in the Den Photo Competition and… won! The photographer himself often recalls this story – both in public interviews and in private conversations with colleagues. “In 2001 I took part in the Den Photo Competition for the first time. I won the Grand Prix for the picture Full Marks. Then Den’s editor-in-chief Larysa Ivshyna approached me and suggested that I work at the newspaper, to which I said: ‘Madam, I’m not yet up to the job at Den.’ But she turned out to be a persistent editor, and I began to work at Den two years later. I really worked here very much. Den encourages you to constantly grow and improve your skills. Then I was invited to work for the president,” Lazarenko says. Den/The Day congratulates its colleague on the US president’s compliment and traditionally expects him to show new work in the newspaper’s photo competition.